You can create a batch/process group for the Prep process as soon as one or more specimens have been received, and add them to that batch/process group. 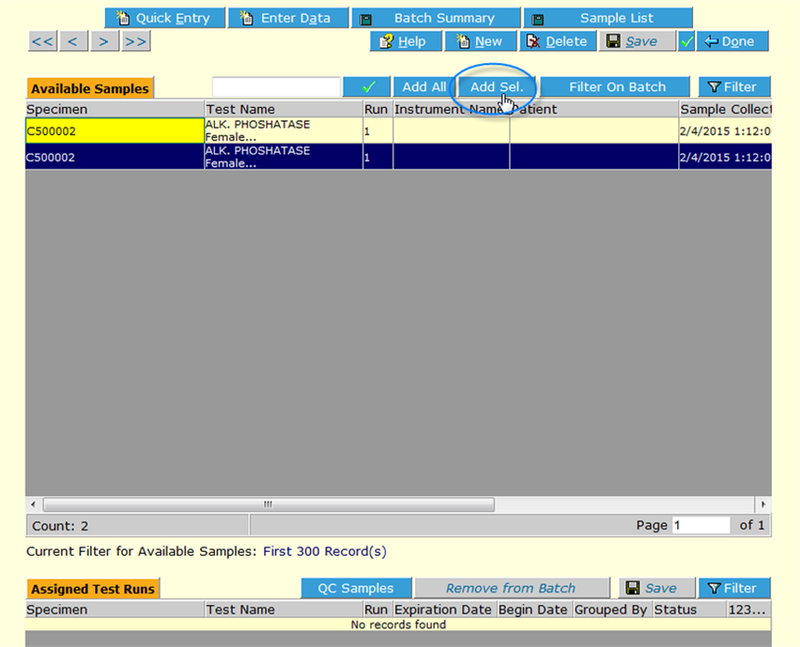 Then, once data have been entered for all specimens in that group (in this case, probably a result of “performed”, “done” and/or a date/time), then the batch is complete, it falls off the list of batches and its specimens are all available for the next process – in this example Analysis. The same process occurs and then a Review batch is created and its specimens’ results reviewed and approved/sent for re-run or canceled. Once all specimens are completed for all processes, they show up in the report. 1. Users must have access to locations, departments, tests etc.. Best practice is to allow all users at first (when defining a test), then narrow access once you know it all works properly. 2. Specimens must have correct Sample Type selected, be Received, be in the same Location and not be On Hold in order to be available for batching. 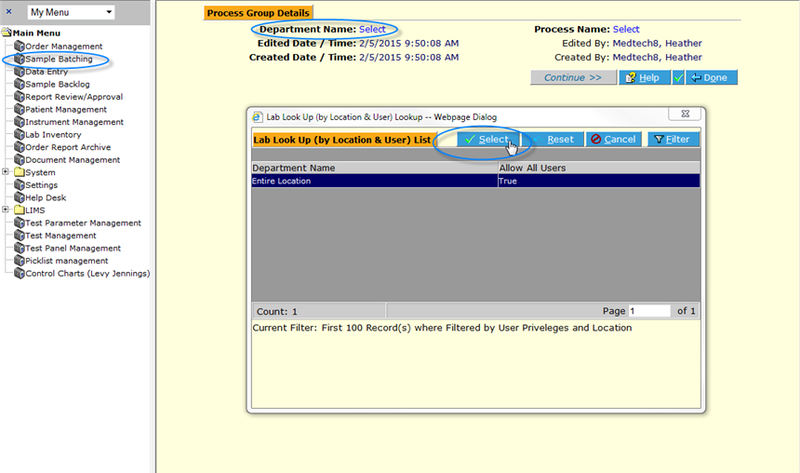 In the Specimen (Sample) Batching screen, click the New button. Click the Continue button. 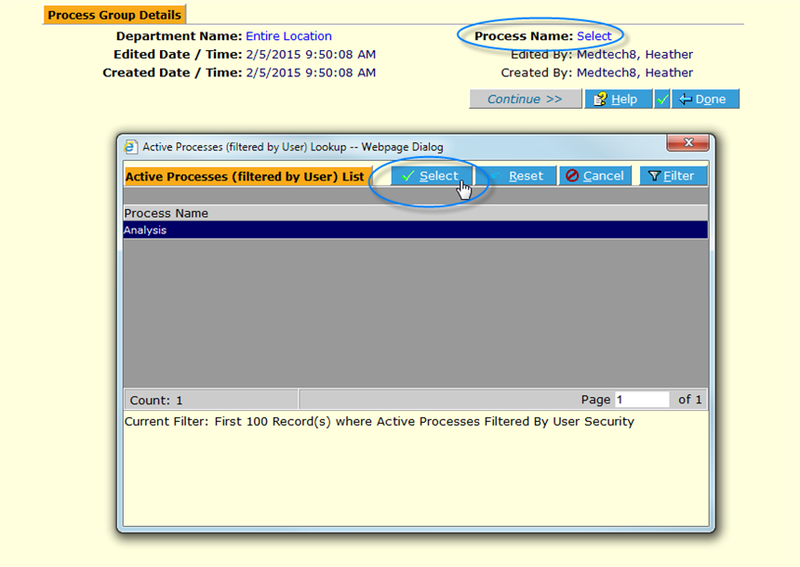 The Batch, or Process Group screen is displayed. It is automatically assigned a unique ID number, according to lab protocol (this is configured at setup). All samples in the Location that are Received, not On Hold and thus available for batching are displayed. Click on the ones to be batched for this Analysis Batch, and click Add Sel. (Add Selected) or click Add All . 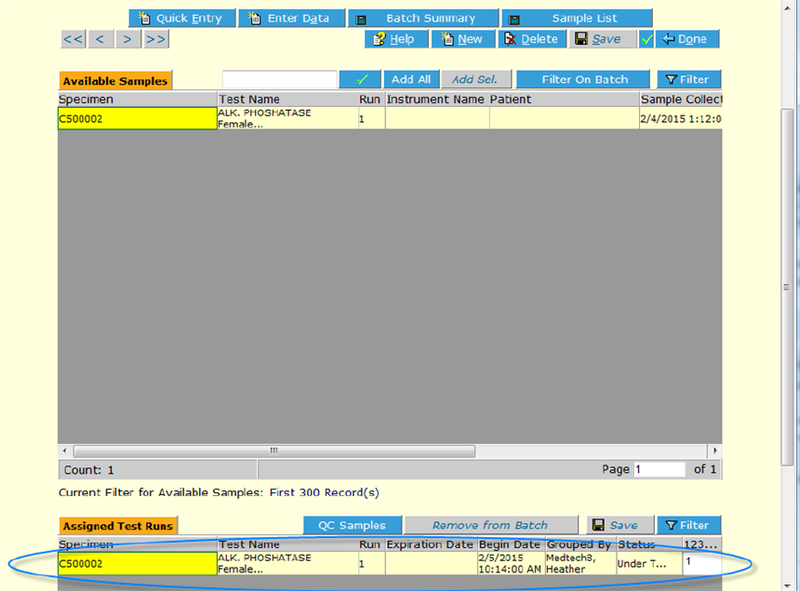 The Sample(s) is/are displayed in the Assigned Test Runs frame below. If there are QC or Control samples defined in the system, they may be added by clicking the QC Samples button and selecting. It is not necessary to Save.